Hey, guess what? I’m in the April issue of Sunset magazine. 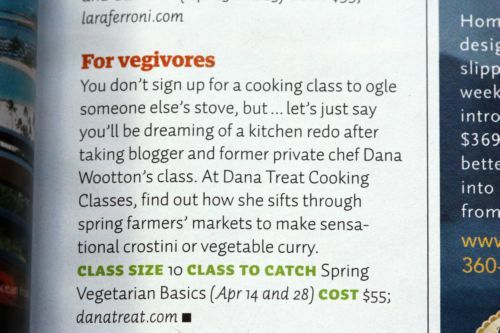 They did an article on boutique cooking classes and I am in there! Cool, huh? On the whole, mine is a family of savory eaters. No one turns up their nose at my sweets but everyone is happier with dinner than dessert. Each person, however, has their thing they cannot resist. As a good treat maker, I know each person’s Achilles heel. For my dad, it is coconut. My brother Alex – anything lemon and he also will eat almost an entire batch of my mom’s snickerdoodles in one sitting. Michael will eat cookies until he is sick and then eat another one. Randy’s weakness is white chocolate and he also loves carrot cake (which I have yet to make for him because I hate carrot cake). I want my last meal on earth to include a brownie. (This one is my current favorite.) My mom loves nuts – she would love these bars. 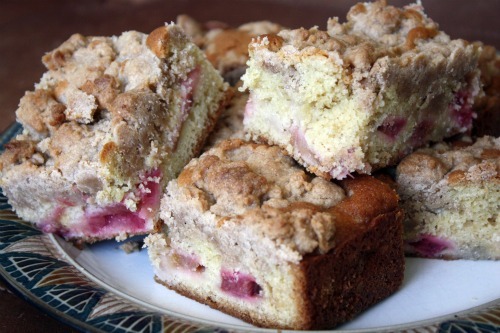 But she also loves a good old fashioned coffee cake. Last week, my parents and Michael came over for dinner. I was fresh out of cookies so decided to make a quick cake that I found in my Baked Explorations book. This book is a mystery to me. I have looked at it so many times and have also made many things from it. I feel like the recipes reproduce overnight or something because every time I open it, I feel like there is something new in there. Some new treasure. Anyway, as I have written about many times here, I am a big fan of a simple cake. Not simple as in boring, simple as in not a three layer cake with fillings and buttercream frosting on a Tuesday night simple. A good simple cake is gold for me. This is no beauty contest winner. 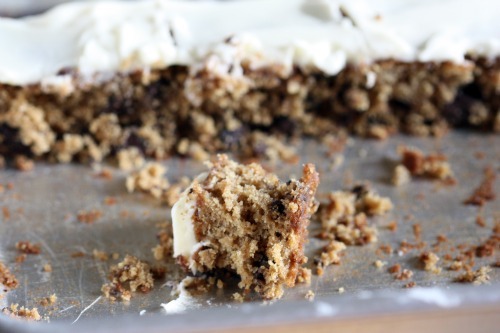 But as I brought it out, my mom said, “That is my favorite kind of cake.” And, seeing as this recipe is found under the Breakfast chapter, it really is a coffee cake. But it is great at night as well. Spencer surprised me by wanting me to scrape off his frosting. He only wanted to eat the cake. This from a child who licks the frosting off his cupcakes and discards the cake part. I guess it is a testament to how tasty this simple cake is. But do make the frosting. Easy and yummy. Preheat the oven to 375ºF and position the rack in the center. Butter the sides and bottom of 9-by-13-inch glass or light-colored metal baking pan. Heat 1¼ cups water to boiling. Place the chocolate chips in a small bowl and toss them with the bourbon until covered. Sprinkle 2 tablespoons of the flour over the chips and toss until coated. This will keep them from settling at the bottom during baking. Set aside. Place the oats and butter cubes in a large bowl. Pour the boiling water over the oat mixture, wait 30 seconds, and stir to moisten all the oats and melt the butter. Set the mixture aside for 25 to 30 minutes. In a separate bowl, whisk together the eggs, both sugars, salt, baking soda, baking powder, and cinnamon until combined. Fold in the cooled oatmeal and stir until well combined. Gently fold in the remaining flour and then the chocolate chips. Pour the batter into the prepared pan. Bake the cake for 40 to 45 minutes, or until a toothpick inserted in the center comes out clean. Let the cake cool on a wire rack for at least 30 minutes. Spread a thin even layer of frosting over the cake. Chill it for 15 minutes so that it can set. Slice and serve. The frosted cake can be keep, refrigerated and tightly covered, for up to 3 days. Bring the cake back to room temperature before serving. I don’t know about you, but our December was a bit insane. I remember looking at our calendar in November and thinking that the holidays were going to be relatively quiet around here. We didn’t have much going on. And then, the onslaught. We had so many events and parties to go to which was wonderful - I enjoyed all of it so much. Our evenings were so busy that we ended up making a lot of brunch plans with friends. 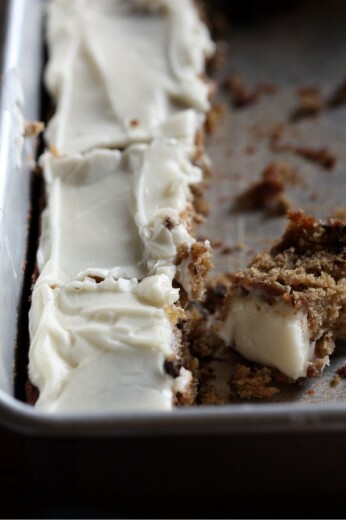 And brunch plans mean coffee cake. 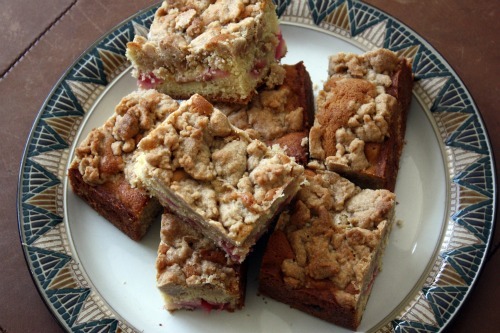 As of this moment, I have four coffee cakes I have not yet told you about. The rule follower in me would probably post about them in chronological order, but I had mildly frenzied requests for the recipe for this cake. I made it a couple of days ago for a brunch with high school friends and seeing as half the people asked me to write about it, this cake jumps to the top of the heap. This is probably the third or fourth time I have made this coffee cake and everyone always goes crazy for it. 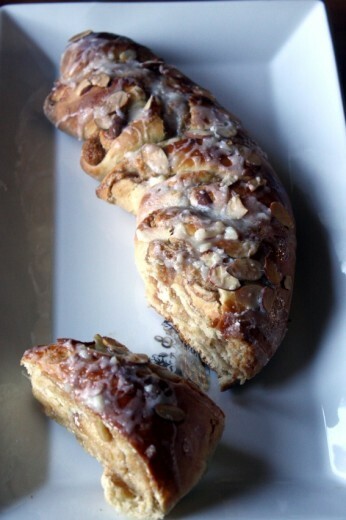 It is an old-fashioned yeasted coffee cake with an almond filling and one of the many wonderful things about this recipe is that it makes two of them. You can either serve them both, or you can wrap one up (before baking) and freeze it for another time. When just out of the oven, they are horseshoe or ring shaped. I baked mine at our friends’ house because I misjudged the timing and I did not bring my camera – this photo shows the aftermath of the second cake. The first was devoured. These are not hard to make. Take your time, follow the directions carefully and you will be thrilled with the result. This recipe comes from Cook’s Country who are the same folks as Cook’s Illustrated so you know the recipe was tested to perfection. Fit stand mixer with paddle attachment and mix almond paste, confectioners’ sugar, dark brown sugar, cinnamon, and cream cheese until smooth. Cover with plastic wrap and refrigerate until ready to use. Adjust oven rack to upper-middle and lower-middle positions and heat oven to 200ºF. When oven reaches 200, shut it off. Lightly grease large bowl with nonstick cooking spray. Line two baking sheets with parchment paper. On lightly floured work surface, divide dough into 2 equal pieces. Working with one piece at a time, roll dough into 18-by-9-inch rectangle with long side facing you. Spread with half of filling and roll up dough. Brush top edge with water, then press to seal and transfer, seam side down, to parchment lined baking sheet. Repeat with remaining dough and filling. Shape each cylinder into a ring or horseshoe. Using paring knife, make cuts around outside of dough, about 1½ inches apart, leaving about an inch of intact dough at the top of your cut. In other words you are making slices but keeping the cake together as one unit. With your fingers, turn each “slice” of dough so that the filling is showing. Cover with plastic wrap coated with cooking spray and return to oven until rings have puffed slightly, 30 to 40 minutes. remove from oven and heat oven to 375ºF. A new friend recently asked me about Christmas morning food traditions in our house. I’m not sure what she was expecting but the truth is that Christmas is still relatively new to me. I grew up in a household that was culturally Jewish and religiously agnostic. We lit the menorah on Hanukkah but we didn’t open presents each night because it drove my parents insane to be asked when we were opening our gifts for eight straight days. (Now that I am a parent, I understand this.) Even though half the time we forgot to light the candles, my mom drew the line at a tree or stockings. Each year we would ask and each year she would say no. Consequently, two of her children, the ones who married non-Jews, go absolutely nuts at Christmas. My youngest brother doesn’t really care either way, but my middle brother is the type who has a giant inflatable snow globe in his yard, and Christmas villages set up all over the house. I don’t go quite that far, but we do have a lit-up reindeer and a new penguin sporting a Merry Christmas sign. Truly, the holiday tradition that has endured is celebrating my parents’ anniversary on Christmas Eve. They got married in 1967 while my dad had a few day break from his medical residency. Since all their families and everyone they knew was Jewish, the fact that their wedding day fell on Christmas Eve didn’t make much difference to them. Until they realized in all the subsequent almost 43 years, that their celebratory anniversary dinners were either in a Chinese food restaurant, or in a hotel. In my early 20′s, when I was broke but still wanting to “give” them something for their anniversary, I started making them dinner. As I got to be a better cook, it became a special dinner. And it also just began to make sense that we open our gifts that day rather than Hanukkah. Our holiday is affectionately referred to as Hanumass. Having young children who truly believe in Santa has made me look at Christmas Day with new eyes. Ever since marrying Randy, I have always loved the stockings and presents under the tree, but now Spencer worrying that Santa may trip over the poinsettias that we have in front of the fireplace makes me realize how magical all of this is for children. Special days deserve special traditions. I think my kids are a bit too young to even notice food on Christmas morning – it’s all about the toys. Truthfully, it’s all about the toys for my husband too. (The X-box? It’s for the kids!) 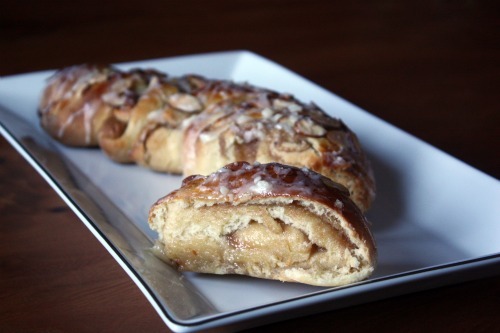 I have some baked goods on this site that I think would be wonderful to share with your family. I’m a big fan of the three Holly B roll-type things on here (cinnamon rolls, almond butterhorns, orange rolls) but if coffee cake is more your thing, this might be a good option for you. I made this for a brunch with friends recently and the kids went nuts over it. The adults liked it too. I appreciate recipes where the result looks so much more impressive than the work you put into it. I bought this cookbook with high expectations. We often have people over for brunch and I like making something sweet along with what is inevitably some variation on eggs and roasted potatoes. A book devoted to coffee cake type things sounded perfect. However. I find the recipes to be incredibly fussy. Lots of (in my mind) unnecessary instructions making the directions incredibly long and daunting looking. But I did like this and several other things I have made from it and so, on the shelf it stays. In a small heavy saucepan, combine the water, granulated sugar, espresso powder, and chocolate. Cook over low heat, stirring occasionally, for 8 to 10 minutes, or until large bubbles form. Remove from the heat and stir in the vanilla and butter. Set aside to cool completely. The mixture should have the consistency of soft fudge. Place the dough on a lightly floured work surface and gently knead it 6 to 8 times, or until smooth. Roll it into a 9×14-inch rectangle with the 14-inch side parallel to the edge of the counter. Using a small offset spatula, spread the cooled chocolate filling over the surface of the dough, leaving a 1-inch border on all sides. Sprinkle the chopped pecans on the chocolate, and using your hand, press the nuts gently into the chocolate. Lightly brush the far edge of the dough with the egg wash. Starting at the bottom edge, roll the dough tightly into a log, pinching the seam to seal. Place the log seam side down, on the prepared cookie sheet and square the ends with a dough scraper or metal spatula. Flatten the log slightly with the palm of your hand. Using scissors, cut about twelve slits at approximately 1-inch intervals on the right side of the dough, cutting about three-fourths of the way through. For the left side, also cut about twelve slits; however, space the slits so that you are cutting in between the slits on the opposite side. Gently turn the slices to expose the filling, and pull them slightly downward, starting with the right side first. After the right side is done, turn the left side. Flatten the top of the cake gently with your hand, and then lightly press the slices so they lay flat against the pan. Cover the cake with a tea towel and set in a warm place to rise for 45 to 60 minutes, or until puffy and almost doubled. Fifteen minutes before baking, position the rack in the lower third of the oven. Preheat to 350ºF. Lightly brush the strip with the egg wash and sprinkle the top with pearl sugar. Bake for 30 minutes, or until golden brown. Put 1 tablespoon of sugar into a small bowl and add the warm water. Sprinkle the yeast over the water. Do not stir. Cover the bowl with a towel and let the mixture stand for 5 minutes . Stir it briefly with a fork, cover again and let stand for 2 to 3 minutes more, or until bubbly. In the bowl of a stand mixer fitted with the paddle attachment, mix on low speed the 3 cups of flour, remaining 3 tablespoons of sugar, and the salt. 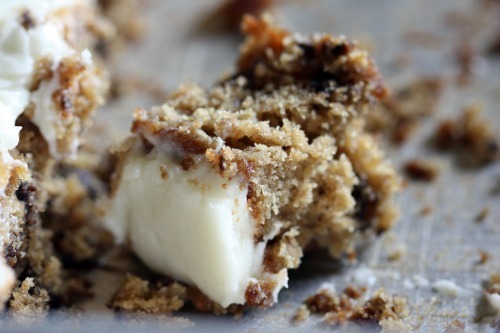 Add the slightly firm cubed butter and continue to mix until meal-size crumbs form, 2 to 4 minutes. Stop the mixer. Using a fork, in separate bowl, mix the milk, vanilla, and egg yolks. Add the milk mixture to the flour, along with the dissolved yeast, and mix on low speed for about 15 seconds. Stop the mixer and scrape down the side of the bowl with a rubber spatula. Mix on low speed for another 30 seconds or until a smooth dough is formed. Note: This is a soft dough. One of the very trickiest things about cooking is the timing. Getting dishes to come out around the same time or having food on the table when you want it to be ready can be very tricky. I truly believe the timing piece only comes with practice. Someone can have a naturally good palate but kitchen timing does not seem to be a genetic trait. I remember struggling with timing when I was first learning to cook. Learning that you really need to read a recipe thoroughly before you start cooking helped. But truly I got better from sheer practice. These days, I’m pretty good at getting everything to come out at once. I’m also good at judging how long things will take start to finish. But once in a while, I get tripped up. 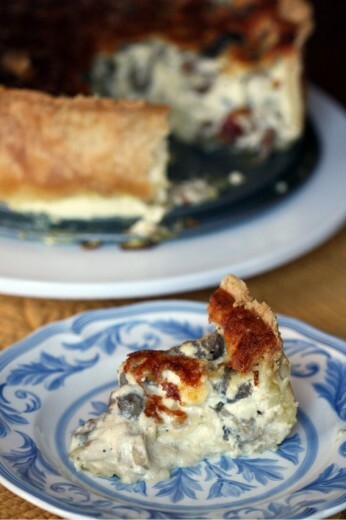 This recipe for a mammoth quiche has been sitting quietly in my notebook for years now. It is a recipe that is never far from my mind. With all the cooking I do, it is hard for me to believe that it took me all this time to make it. I guess it’s not really weeknight cooking because it is a little fussy and it is also huge. It’s not really dinner party cooking because, I don’t know – quiche seems a little brunchy for a dinner party. We have people over often for brunch – so why didn’t I make it one of those times? I wondered all of this as I was preparing to make it. And then, when all was said and done, I realized why. This is a Thomas Keller recipe that comes from the Bouchon cookbook, but I have it because it appeared in Food & Wine. I remember Keller writing that, for him, quiche needed to be large. And boy, is this large. Rather than a tart pan or a pie plate, this baby is made in a springform pan. The crust itself is several inches high. The filling has 2 cups of milk, 2 cups of cream, 6 eggs, 2 pounds of mushrooms, and just a smattering of cheese. It is gorgeous. It is awe-inspiring. And if you ever make it, please remember to read the part where I tell you it takes about 5 hours to make, start to finish. Yep. I had some good friends over today for a late morning get together. I put out pumpkin bread and granola and thought I would serve the quiche as it got closer to lunch time. But, because I had a momentary being-good-at-timing lapse, all my friends left and the quiche wasn’t even out of the oven. I left it in there for a full two hours and, as you can see from the photos, it still wasn’t completely cooked. Regardless of runniness, we will be eating this quiche for days for several reasons. 1) Anything that takes me 5 hours to make will be consumed without question. 2) This is one of the tastiest things I have ever made. 3) I used a pound of button mushrooms and a pound of chanterelles (some regular and some yellow foot) which cost me $16. So, Over the Top Mushroom Quiche it is until Sunday! One of my readers made a terrific suggestion – how about creating a “My Favorites” category. I went back through my old posts and tagged the recipes that I like the very best. You can scroll down to it on the sidebar to your right. In spite of this being truly delicious and a recipe I will no doubt make again – I’m not sure I can call a five hour egg and crust dish a favorite. Not yet anyway. Preheat oven to 325º. In a very large skillet, heat the oil. Add all the mushrooms, season with salt and pepper, and cook over high heat, stirring until starting to soften, about 5 minutes. Reduce the heat to moderate. Add the butter, shallots, and thyme and cook, stirring often, until the mushrooms are tender, about 12 minutes longer. Season with salt and pepper and let cool. 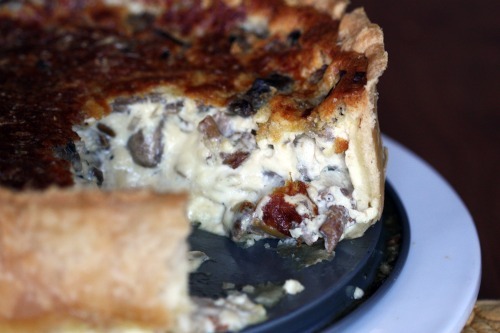 Scatter ¼ cup of the cheese and half of the mushrooms evenly over the bottom of the Buttery Pastry Shell. In a blender, mix half each of the milk, cream, and eggs and season with 1½ teaspoons salt and 1/8 teaspoon of pepper. Blend at high speed until frothy, about 1 minute. Pour the custard into the pastry shell. Top with another ¼ cup of cheese and the remaining mushrooms. Make a second batch of custard with the remaining milk, cream and eggs plus the same amount of salt and pepper, and pour into the shell. Scatter the remaining ¼ cup of cheese on top. 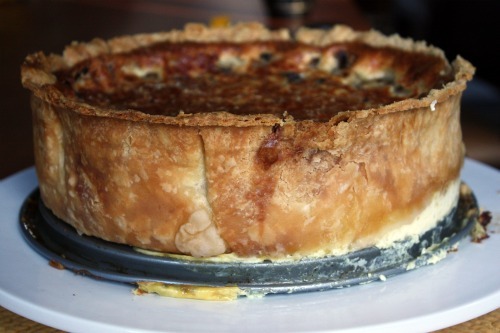 Bake the quiche for about 1½ hours, or until richly browned on top and the custard is barely set in the center. Let cool in the pan until very warm. Since I love to make savory tarts and galettes, I have a lot of experience with tart dough. I have learned to sacrifice flakiness for flavor when using all butter. This crust is almost impossibly flaky in spite of having no shortening and the flavor is terrific. In the bowl of a standing mixer fitted with the paddle attachment, mix 1 cup fo the flour with the salt. At low speed, add the butter pieces, a handful at a time. When all of the butter has been added, increase the speed to medium and mix until the butter is completely incorporated. Reduce the speed to low and add the remaining 1 cup of flour just until blended. Mix in the water just until thoroughly incorporated. Flatten the pastry into an 8-inch disk, wrap in plastic and refrigerate until chilled, at least 1 hour or overnight. Dust the pastry on both sides with flour. On a lightly floured work surface, roll out the pastry to a 16-inch round, about 3/16-inch thick. Carefully roll the pastry around the rolling pin and transfer to the prepared ring, pressing it into the corners. Trim the overhanging pastry to 1 inch and press it firmly against the outside of the ring. Use the trimming to fill any cracks. Refrigerate the shell for 20 minutes.